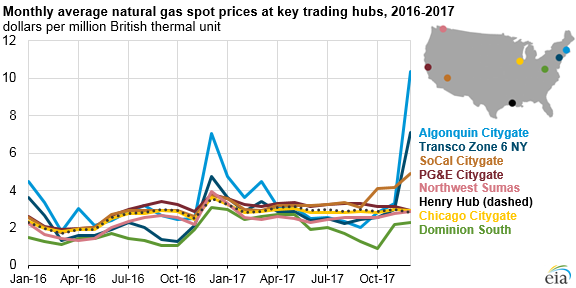 In 2017, natural gas spot prices at the national benchmark Henry Hub in Louisiana averaged $3.01 per million British thermal units (MMBtu), about 50 cents per MMBtu higher than in 2016. The higher prices in 2017 contributed to less natural gas consumption for power generation. Increased domestic production was offset by increased exports of natural gas by pipeline and liquefied natural gas (LNG) cargoes. 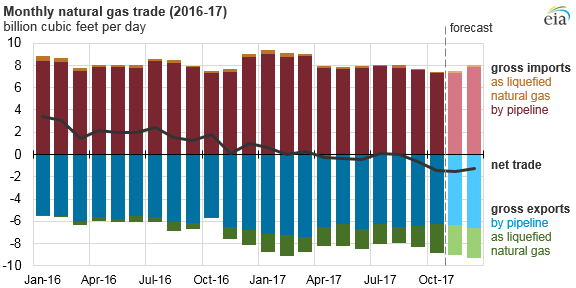 Overall, natural gas prices at key regional trading hubs were less volatile in 2017 than in previous years, as pipelines that came online throughout the year eased some infrastructure constraints that affect regional prices. In the Northeast, which tends to have large price spikes during periods of cold weather, new pipeline capacity, along with warmer winter weather, helped to moderate price volatility. However, record cold temperatures at the end of December in the eastern United States led to record high demand for natural gas and significant price spikes at many trading locations. Additional takeaway capacity in the Appalachian region, the region with the largest U.S. natural gas production growth in 2017, continued to narrow price differences between Henry Hub and nearby trading hubs such as Dominion South in western Pennsylvania, Transco Zone 6 NY in New York City, and Algonquin Citygate near Boston, Massachusetts. Until the last few days of 2017, relatively warm winter weather limited natural gas consumption growth in the residential and commercial sectors compared with 2016 levels. However, higher natural gas prices contributed to a 6% year-on-year decline in natural gas consumption for power generation, based on data through October and projections for November and December. This decline was despite a large increase in natural gas-fired capacity additions in 2017, as coal became more competitive with natural gas. Mild winter temperatures in early 2017 also limited natural gas storage withdrawals, with the first-ever net injection recorded in the month of February. As a result, natural gas storage inventories ended the injection season lower than last year, but higher than the previous five-year average. Future U.S. pipeline exports to Mexico are supported by a near doubling of U.S. export pipeline capacity to Mexico by 2019. However, further growth in natural gas pipeline exports to Mexico will be contingent on the timely completion of Mexico's connecting pipelines, which so far have experienced construction delays. U.S. marketed natural gas production increased by 1% (1 Bcf/d) in 2017, according to EIA's preliminary estimates for the year. Regionally, natural gas production growth was concentrated in Appalachia—primarily in the Marcellus and Utica shales. Other regions have also increased production, including the Anadarko region in Texas and Oklahoma and the Bakken region in North Dakota.